From all this fussing with turkeys, I've come to realize that my turkey will never be perfect. Let's face it: turkeys, on their own, just aren't very good, no matter how much lipstick you put on it. That's what gravy and cranberry sauce are for. As Mary Risley from Tante Marie's Cooking School so humorously points out in the video below (which you should definitely watch, especially if you have any turkey-cooking anxiety), "I have never had an outstanding turkey." 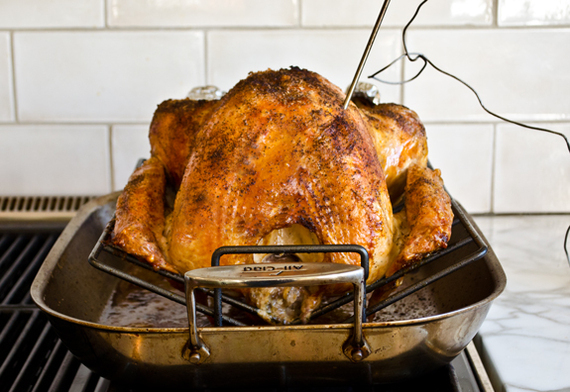 Short of purchasing a special turkey cooker (this is the one I have), it is near impossible to cook a turkey perfectly: the white meat always cooks before the dark meat is done and the skin on the bottom is never crisp (unless you flip the hot, sputtering bird mid-way through cooking -- ummm, no thank you!). So is it really worth it to go to great lengths -- brining in big coolers for days in the garage, risking life and limb deep-frying in the driveway, pre-icing the breast of the turkey so it cooks more slowly (I swear, there's a very respectable cooking magazine that wants you to do this) -- to make that End-All-Be-All turkey? It's up to you, but I don't think so. I'm not interested in babysitting my turkey for three days to get marginally better results at the end. My advice to you on Thanksgiving is to keep it simple. 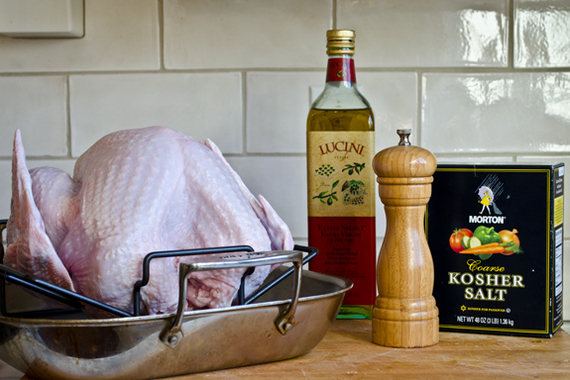 Make an easy roast turkey (i.e., just put the #&? @#!#% in the oven) along with an over-the-top delicious gravy and some cranberry sauce to go with it. Focus your time and creativity on the side dishes and desserts because that's what everyone really looks forward to anyway. Of course, I would not leave you high and dry without a recipe. And, you know me by now, I would not just haphazardly "stick a turkey in the oven." But, funny enough, my favorite recipe -- the 2-Hour Turkey -- does just that. Developed by Sunset Test Kitchens for Safeway (I know, but trust me), the 2-Hour Turkey requires no brining or stuffing, fancy seasoning, trussing or injecting. It's just a plain ol' turkey seasoned with olive oil, salt and pepper and roasted in a 475-degree oven until the skin is crispy and brown and the meat is juicy. From all my turkey travails, I can tell you that this simple high-temperature method is the absolute best (and most sensible) way to cook a turkey. 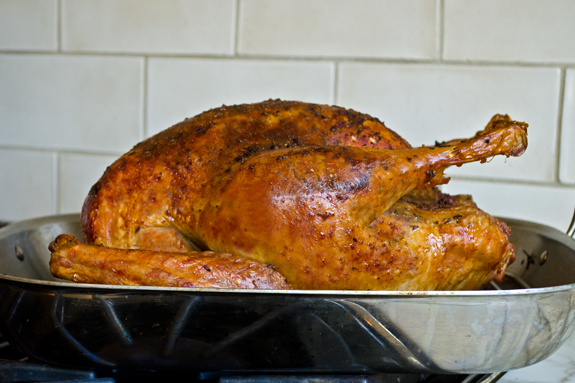 Believe it or not, depending on the size of your bird, the turkey cooks in 1-2 hours. I know it sounds impossible if you've been waking up early for the last twenty years to slow cook your turkey but I promise you it works. The turkey is cooked to an internal temperature of 160 degrees in the oven (not the 175 to 180 degrees most experts recommend) and comes up to just the right temperature while it rests. Keep in mind, while the 2-Hour Turkey might be one of the best, juiciest turkeys you've ever made, it will still taste like turkey! Be sure to make my gravy and cranberry orange sauce to go with it.